Oh Snap! The Friggin Amazing J.Ho Sketchblog...: What the what? Question 1: Is this the dumbest thing I've ever posted? Probably. Question 2: Is this the nerdiest thing I've ever posted? Almost certainly, but I have every intention of trying to continually out-nerd myself. Question 3: In spite of being both dumb and uber-nerdy, is this also the most awesome thing I've ever posted? I think so, yes. If you're still reading, you're probably still asking yourself, why? Well, I've been enjoying Green Lantern since the Sinestro Corps War, and I really like the idea of the Sinestro Corps having high-profile members like Superboy Prime, Mongul II, and Hank Henshaw. So my naturally nerdy brain was scanning its archives for other characters capable of instilling great fear, and since I had already crossed over Star Wars with the Green Lantern mythos, once or twice--I came up with Darth Vader. Before you protest--yes, I'm aware that this concept wouldn't really work in the continuity of either Star Wars or the DC Universe due to the fact that Darth Vader died a long time ago, in a galaxy far, far away... long before the Sinestro Corps had ever been formed. If I had to come up with an explanation, I would say that the ghost of Anakin Skywalker was psychically controlled/driven insane by Parallax, and had regressed into the psyche of Vader once more. With his spirit trapped in the hollow shell of his suit of armor, and powered by a yellow power battery, Darth Vader is now forced to serve the Sinestro Corps as perhaps their most powerful enforcer. It had occurred to me that Vader could have made a good Red or Black Lantern. However, I'm not so into the Red Lanterns, and I'm not entirely sure how the mechanics of the Black Lanterns work. Overall, I find the fear-based Sinestro Corps to be more compelling. The really scary thing is that these hyper-nerdy thought-processes basically all occur without conscious effort. I'm just walking around doing normal things, like drinking Vitamin Water and playing with Legos. Meanwhile my brain is running these dorky match-ups between continuities in the background, and I'm only aware of them in a vague semi-conscious manner. 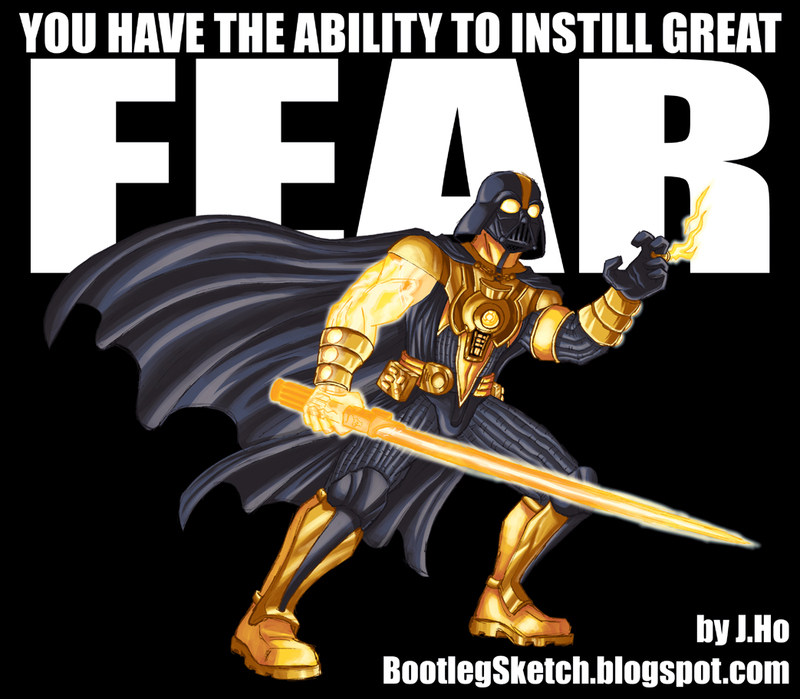 BAM, next thing I know, I'm drawing Darth Vader with a yellow lantern embedded in his chest. It's a blessing and a curse, people. A blessing and a curse.